One of the best things about the Lookout Mountain Attractions is all of the unique regional gifts and souvenirs available at each attraction. If you are looking for a world famous "SEE ROCK CITY" birdhouse or an official Ruby Falls spelunker's helmet, it is now even more convenient to bring some of those great items to your friends, your family and you. Visit the Rock City and Ruby Falls online giftshops for some of the best attraction souvenirs from the South. 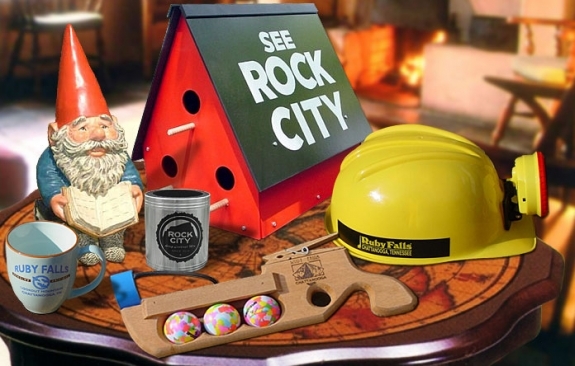 Head to Rock City's online gift shop to buy a "SEE ROCK CITY" Birdhouse. They also have home-made fudge available along with Rock City Gnome hats. Their current online gift shop is under construction. Click to learn more about the services and facilities at Ruby Falls and have the ability to purchase pictures!